The play is almost all spoken voice with a few "flare" effects (which sound like bursts of filtered noise) and Delia contributes two pieces of music, one as the Intro before the speaking starts and one as the tail-out, again thankfully without a spoken voiceover. The play is almost all spoken voice with a few "flare" effects (which sound like bursts of filtered noise) and Delia contributes two pieces of music, one as the Intro before the speaking starts and one as the tail-out, again without a voiceover. A smooth, gently evolving melodic soundscape, unfortunately with an actress sobbing over the fadeout of the last sound. A smooth, gently evolving melodic soundscape, unfortunately with an actress sobbing over the fadeout of the final sound. "Rat Attack" is the name Paul D'Andrea gives to Delia's outro music to the play, though the sound is more similar to a symphony of seagulls' cries. "Rat Attack" is the name Paul D'Andrea gives to Delia's outro music, though the sound is more similar to a symphony of seagulls' cries. Delia created music for The Autocrat, an Arts & Education Feature for radio written and produced by Paul D'Andrea and directed by Michael Rolfe. The "entry date" for its tape is April 1971. The tape catalogues and programme listings call it "Autocrats" or "The Autocrats" but its correct title is "The Autocrat". financed the production of a series of radio plays, some of which were purchased from the BBC, and it was broadcast by KRAB-FM, a NPR affiliate at that time on 28th April 1974 at 7:30pm,, 5th October 1974 at 8:30pm, 30th April 1976 at 2:00pm and 18th March 1977 at 7:30pm. but they do not include The Autocrat. Paul D'Andrea has kindly digitised his master tape and given permission for the Delian audio to be included here. 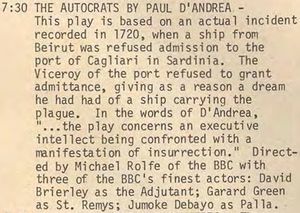 ↑ 2.0 2.1 The end credits to the radio play run: "The Autocrat was written by Paul D'Andrea". ↑ 3.0 3.1 Personal communication from Paul D'Andrea, September 2016. ↑ 4.0 4.1 Personal communication from Paul D'Andrea, June 2017. ↑ 5.0 5.1 KRAB.FM's programme listing for April 1974. ↑ Nothing in the Radio Times listings at the BBC Genome Project matches it.